STOP THE WATER SOURCE: If it is possible and safe, turn off the water source. This will help minimize the flooding and damage you incur. Turning off a local supply valve or the main water supply may help you tremendously. FIND A RELIABLE EMERGENCY PLUMBER: This is probably not a do it yourself moment. When serious flooding wreaks havoc on your home or business, hiring a reputable professional can save you time and money in the long run. 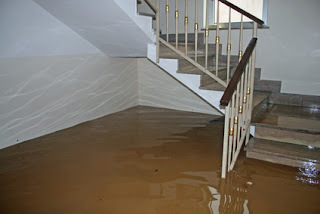 They can offer quick water removal and water damage repairs. You also want to be sure the true underlying cause of your flooding is immediately addressed. SALVAGE YOUR PROPERTY: If water is rising, try to move your valuables to higher ground on your property. Mitigating your loss is very important. But only do this if it is completely safe to do so. Hopefully these tips will help you in the face of a plumbing emergency. Be sure to immediately contact your insurance company as well. You very well may be covered for the damage that has been caused. Lang Restoration specializes in emergency plumbing repairs that may result from burst pipes, sewage backups and other plumbing problems. Call us for 24/7 emergency plumbing services in Metro Atlanta. Professional Fire, Water, Storm & Disaster Restoration Services In Metro Atlanta.